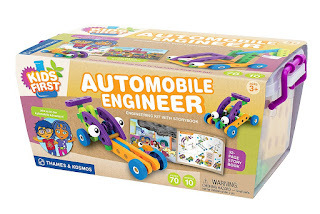 Check out this Kids First Thames &amp; Kosmos Automobile Engineer for $26.46 (Retail $44.99). Read the funny story of Karlie and Ty Omega, two inquisitive kids who build simple models of the vehicles they encounter on their comical trip to the supermarket with their dad. Along this roundabout journey, the kids build various vehicles to help the people in their town solve problems and complete tasks. As you follow the story, you can build models of the 10 vehicles in the story. Large, colorful plastic building pieces make it easy for small hands to put the models together.